"Since getting help from the Childhood Goat Trauma Foundation, I've been able to go outside for the first time in twenty-two years! Thank you, CGTF!" "I thought that the goats were out to get me. People called me paranoid, but since attending one of the CGTF's workshops, I know I'm right. Goats ARE out to get me! And now I can protect myself!" "Even though a goat ate my arm, thanks to the CGTF I've been able to stop hiding behind drugs and alcohol and face the world again. I'd recommend the CGTF to anyone!" "It's good to know that someone can help unfortunate children like my Freddie. 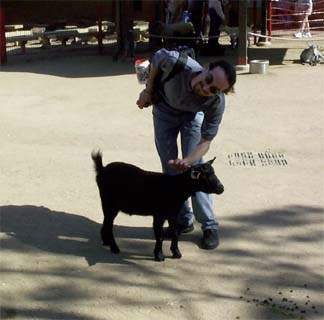 He's like he was before we took him to the petting zoo. CGTF is a godsend!" "I was worried about all those goats that kept congregating outside my house at the new moon. Thanks to the CGTF, I've learned how to construct an effective Goat Repellent System for home defense"
We received this picture from Mike W. formerly of Rockville, MD. After years of running in fear from any animal larger than a gerbil, Mike came to the CGTF this past spring. After only a few workshops, he was able to be around cats, dogs, and ponies. A few more and he had conquered his fear.